at Wesleyan Potters in Middletown, CT. The many layered realities of the history and visual archives of my communal ancestry establish and impart creative purpose and structure in my studio practice and research. Quilts from Slavery and Antebellum periods, made on and off of cotton plantations by enslaved and free blacks, through mid-20th century, serve as the point of departure and visual window I use to explore and connect with this complex time in American history. The quilts of these periods are of particular interest to me for their uniqueness of origin, evolution, aesthetics and range of techniques and processes. Even more, I have a personal devotion and connection to the lives of the quilters and intersecting events of this time. Quilts from these time periods reveal a distinct historic blending of aesthetic, culture and tradition between the people of early America via the Atlantic Slave trade and effects of colonization. The visual and historical synthesis of quilts, cotton trade, and vast realm of textiles, inform and shape my ideas, concepts and approach to the spectrum of ceramic material. 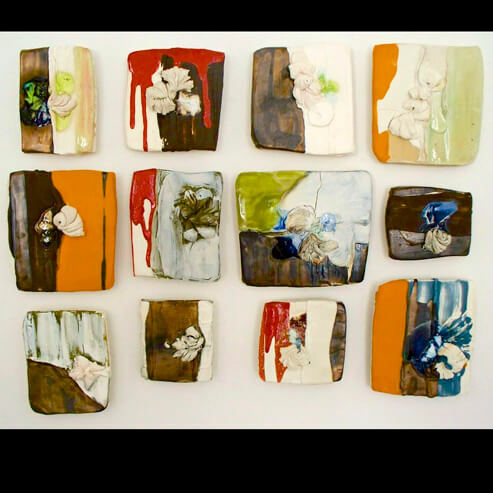 Experimentation in glaze chemistry is a primary focus of my studio practice. Color and color relationships are central in my work. My objective is to develop, accumulate and employ a diverse range of glazes, as well as various clay bodies and colored slips, allowing me to create color dynamics that embody the myriad of visual elements, qualities and categories of quilts I have surveyed. It is intentional that the individual tiles are not repeated. I mix and compose the different tiles to express the various visual modes, traditions and language of quilts and greater realm of textiles. Adaptation, resourcefulness, survival and triumph, are what I appreciate when I consider the fullness of these quilts, their makers and the history from which they emerge. Cotton, the commodity at the center of my ancestry, by way of its production and trade, lead me to the global history, trade and impact of textiles. Encountering these various cultures and time periods have influenced my work. Each unique tile within the quilts I create, are informed by and reflect the combined and diverse visual history of quilting and textiles. Also the tiles symbolize the contrasting events and lives of those who sewed and stitched more than quilts; those who stitched and sewed a resolute history and legacy that has gifted freedom, personhood and rich visual language. It is this history to which I am indebted, inspiring me as an artist. I strive to sustain and honor the gifts of my personal and collective history embed in the visual chronicles of quilts, textiles and lives.